What can I say? Two hundred gigabytes just ain’t that big anymore. 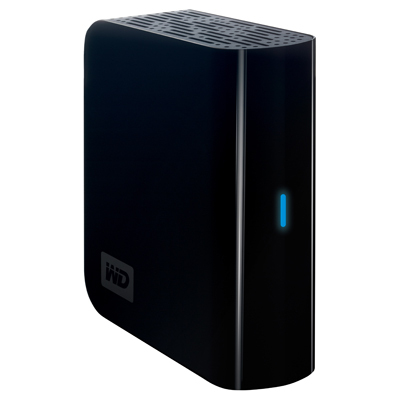 Western Digital is offering this series of MyBook drives in a number of different configurations, including a 500GB RAID, and the Essential Edition that I purchased featuring a 1TB partition. I bought this one on sale at Circuit City, but I guess I should have waited a few weeks for them to announce their death, I could have saved even more. The only thing I don’t like about the drive is that it doesn’t have a power switch. It auto-senses whether or not your computer is on, and turns itself on and off. This is less than optimal. I prefer to control the power myself, which means I have to unplug the USB cable to turn it off. Also a word of caution if you plan to use this drive to store large files (such as movies), you will need to reformat the drive from FAT32 to NTFS. I miss the big blue button on the front of my Maxtor that could be configured to launch your backup software, but apart from that, this is a great no-frills drive for the price. Oh my goodness I love the quote on your homepage — I just hope it’s not me! ;)I came here to check your recent pictures and while I miss keeping up more with the kids, I have to admit I’m happy to see you haven’t updated the photo album in a couple of weeks — it makes me feel better! I am classically behind, I’m afraid. You’ll have to check our blog, though, I did get a short video of Becca doing her army crawl.Talk to you soon, hope you are all doing great!